Pest description and crop damage A small gray weevil about 0.1 inch long. Larvae damage two to four seeds in each pod. Adults feed during bloom, and larvae feed within and destroy seeds. 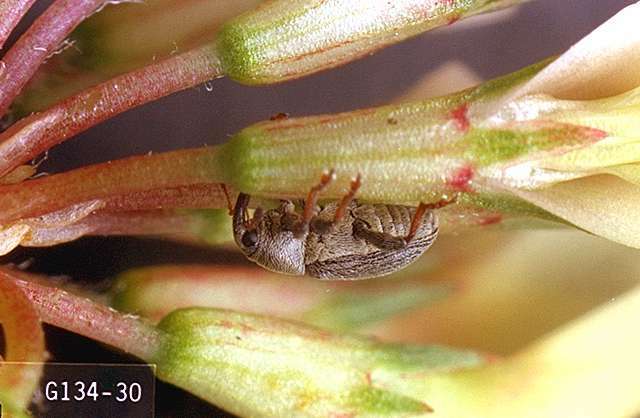 This pest can seriously infest white clover and needs routine control in western Oregon. They attack alsike, white, arrowleaf, and Ladino clover but not red clover. Second-generation weevils neither harm seeds nor lay eggs. Although they will be in fields near harvest, they do require control before harvest. Apply insecticide after pollination when first blooms turn brown. Ensure bees have moved from field or the beekeeper has been notified. Use a sweep net to sample the weevil adults. Treat when an average of two or more weevils are found per straight-line sweep (90°). bifenthrin (Bifenture EC, Brigade 2EC, Discipline 2EC, Fanfare 2EC, Fanfare ES, Tundra EC) at 0.06 to 0.1 lb ai/a. REI 12 hr. Do not apply to blooming crop or allow to drift while bees are actively visiting bloom Do not make more than 3 applications per crop year. Allow at least 21 days between treatments. Do not graze clover after application. Do not cut treated clover for hay or forage. Do not use harvested seed for sprouting. No part of the treated field, including seed, seed screenings, hay, forage, or stubble, may be used for human or animal feed. Processed seed must be labeled. 24c SLN: OR-040039, OR-070013, OR-170012, ID-080011, ID-040009, ID-070009, ID-060023, ID-130004, WA-040027, WA-070015. chlorpyrifos (Lorsban Advanced) at 1.0 lb ai/a. REI 24 hr. This product is highly toxic to bees. Do not apply when any clover bloom is present. Do not make more than one application per crop year. Do not graze clover after application. Do not cut treated clover for hay or forage. Do not use harvested seed for sprouting. No part of the treated field, including seed, seed screenings, hay, forage, or stubble, may be used for human or animal feed. Processed seed must be labeled. 24c SLN: OR-090010. Oregon only.